Do you have a friend or family member who is a runner? Do you know someone who wants to run but struggles or doesn’t know where to begin, suffers from injuries or wants to be better? Give them the gift that will help them do what they love and will last their entire life. 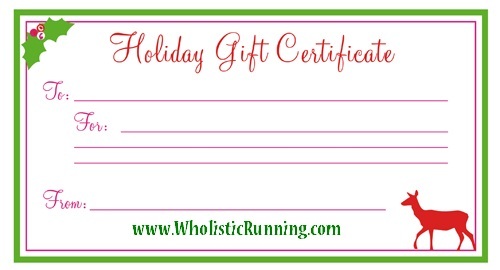 To quickly and easily purchase a gift certificate, just purchase an Online Coaching Package HERE and then print one of the following gift certificates to give as a meaningful, lasting present.